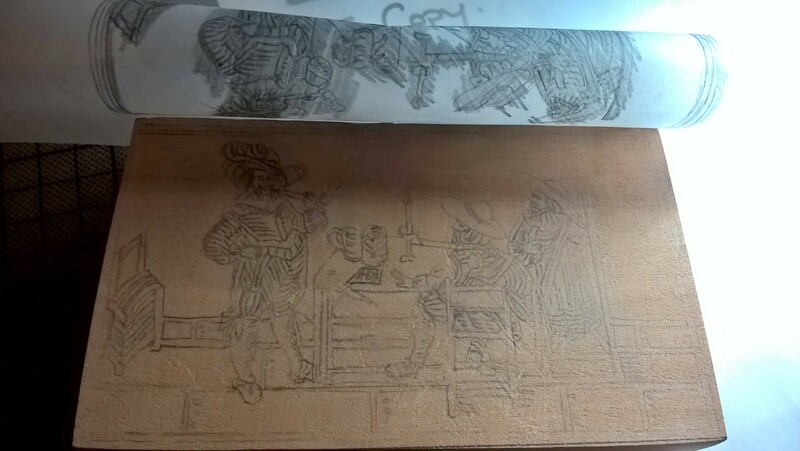 How to get the paper image onto the block ready for carving? There are several different ways. The traditional Japanese process is to paste the paper face downwards onto the block and rub away the top layer while the paper is damp, leaving a faint image visible as a guide. In this way, the necessary reversal of the image is done automatically. I tried this a few years ago, and ran into two difficulties. Firstly, removing the right amount of paper was quite tricky, and left more than a few ridges and bald patches. Secondly, cutting through both the wood and the bumpy-in-places paper layer, caused a few slips. I think this is a method where both skill, and the right kind of paper, are required. The method I use now is more or less the one I learned at school. ..
First thing to note is that the block is ready cut to size and made type high. I take some tracing paper (I used to use my mother’s greaseproof baking paper) and secure it to the drawn image with a paper clip or two. I take more than I need for the image. I then trace it with a soft pencil, at least 4B. 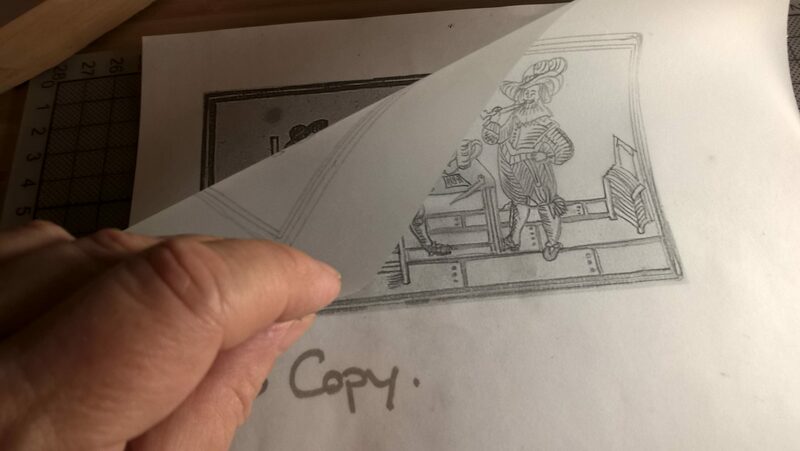 Then, turning the tracing paper over, I fit the traced image to the block. I wrap it round so that when the block is resting on my desk, it is secure underneath and won’t slip: maybe a bit of cellotape to make sure. Scribbling over the soft-pencil tracing. Then I take a hard pencil and rub all over the lines so that they transfer onto the block. When we were kids we used to buy Letraset transfers, where we could position little coloured figures onto a blank landscape background. I don’t know if these things are still sold, but that’s the technique: not trying to follow the lines but thoroughly rubbing over and around. It is important to make sure it is all done, since when the tracing paper comes off the block, the positioning will be lost. 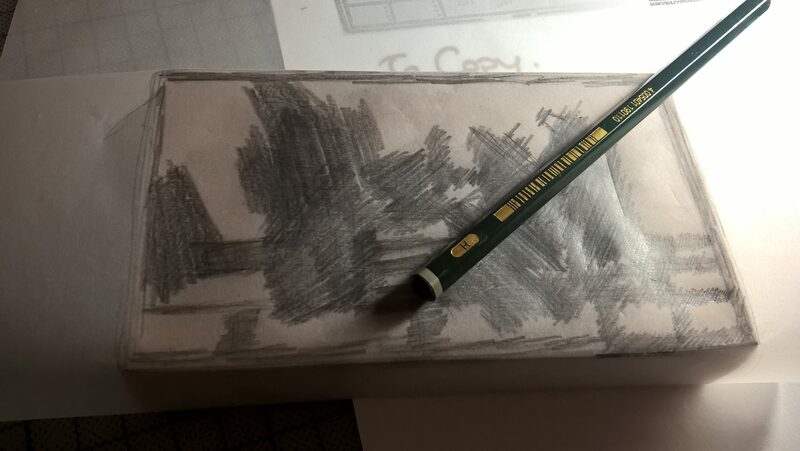 Pencil lightly transferred onto the wood. After this, I have a faint pencil image on the block. The last step of this stage is to go over all the lines with a fine indelible pen. Is this true to historic methods? Almost certainly not. 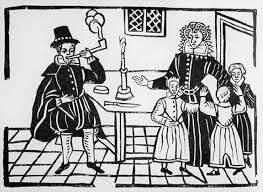 There was a recognised process for engravings* but it was more typical for woodblock designers to draw directly onto the block**. A not-quite-fine figure of a man. With our lower end prints, I believe you can see the evidence of this method being used by artists who were untrained, where you get images of people with short legs or small feet: the designer starts with the head in the middle, and runs out of room at the bottom. Indeed, in the image I’m copying, I could say something about the chair on the side of the picture. No opportunity to correct, or erase: time is money! And now I have the image on the block, and I’m ready to start carving…that’s part 3. *Antony Griffiths, the Print before Photography, British Museum 2016, page 34.